With 29 days until the presidential inauguration, most progressives are feeling horrified by the prospect of the White House soon becoming the residence of a man who pledged during his campaign to deport millions of undocumented immigrants en masse, ban Muslims and forcing those in the country already to sign up for a registry, and expand Stop-and-Frisk policing. No doubt, our core values of equal opportunity, toleration, and the rule of law are in jeopardy. For white progressives, this moment raises a particular question: given that many of the most egregious policies from the new administration will not target white people, what can we do to help stop Trump? One key part of the answer: be ready to put your body on the line. As two white people working at a social justice organization, we have observed a surge of interest from other progressive white people since Donald Trump’s election in supporting grassroots organizations. In this difficult moment, there are, of course, various traditional ways for people with privilege to support the struggle of communities of color and immigrants. All progressives with means can, and should, donate resources to social justice organizations, volunteer for local groups, and contact their legislators to take action to stop Trump’s agenda. But volunteerism and calling one’s legislators alone will not suffice at a moment where entire communities — and our nation’s very social fabric — are at risk. Blocking the Trump administration’s efforts to terrorize immigrants, Muslims, and communities of color will require contentious direct action, which will include protest in the streets and civil disobedience. And those with the privileges of whiteness, US citizenship, and socio-economic security must be ready to participate. Protest is fairly uncommon for most Americans. A Pew Global Attitudes Project poll in April 2016 found that only 4 percent of Americans had participated in an organized protest in the past 12 months, and only 12 percent had done so in the more distant past. 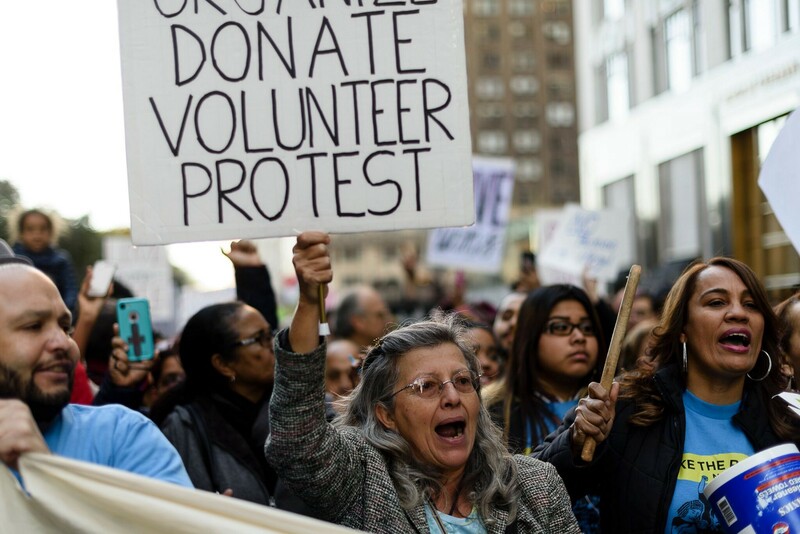 But, in recent years, we have seen movements like Black Lives Matter (BLM), the Fight for $15, and the immigrant rights movement succeed in regularly mobilizing thousands of people to action, with substantial impact. The Fight for $15, for instance, has won minimum wage increases in states and cities across the country, while BLM and immigrants rights leaders have changed the national conversation about police reform and attempts to scapegoat immigrants. At a time when the new President has promised an unparalleled trampling of the rights of immigrants, Muslims, and communities of color — not to mention the evisceration of our nation’s social safety net, an assault on workers’ rights, and unprecedented attacks on women’s control of their bodies — we are going to have to become much more accustomed to taking to the streets. In 2017 and beyond, these actions will be led primarily by immigrants, Muslims, and people of color. That is as it should be: the movement to defeat Trump’s agenda should be led by the communities directly affected by his attacks. White people can be supportive and helpful, but we will not be the principal protagonists. Our duty is to show up and to stand with our brothers and sisters for a more just world. And we must be ready for truly contentious protest, including civil disobedience. Protest during the Trump era will be about more than just public demonstrations to call for a particular public policy or attracting press attention to our causes; it will need to be a tool to prevent the passage and implementation of an unjust agenda that would irreversibly harm millions of people. The United States has a long and rich tradition of civil disobedience, ranging from Henry David Thoreau to the Civil Rights Movement to anti-Vietnam and anti-Apartheid protests. The core premise is simple: where government is acting illegitimately and taking actions that run afoul of the basic tenets of our democracy — such as free speech and equal protection — ordinary citizens should do what they can to prevent others from suffering harm. In most cases in our recent history, progressives have focused on organizing to amend or replace bad laws and policies. But the Trump era, which poses graver threats to our communities and the fabric of our democracy than any recent political moment, will require bold and disruptive “transgression.” Civil disobedience will be particularly critical under a Trump administration because his cabinet will be filled with extremists (likely including notorious racists Steve Bannon and Jeff Sessions, as chief strategist and Attorney General, respectively), and the Republicans in control of both the Senate and the House are unlikely to check his efforts to carry out his intolerant agenda. With little accountability on Capitol Hill, there will be many cases where only the people, taking bold direct action, can disrupt Trump’s efforts to tear apart millions of immigrant families and discriminate against Muslims and people of color. Bold action will require a willingness to get arrested — and even risk bodily harm, as we’ve seen recently in the valiant and successful efforts of indigenous protesters at Standing Rock. When government fails to listen to popular opinion and scorns popular demonstrators, as Trump has already done in response to the large-scale mobilizations following the election and will likely continue in 2017, civil disobedience is a powerful tool. Citizens putting their bodies on the line is a critical means to confront those in power with the deepest objections to unjust rule — and to do so publicly, so that those in power are forced to respond. Such civil disobedience carries with it substantial risks for some. Under a Trump administration intent on quickly deporting millions of undocumented immigrants and Muslim immigrants, many members of these communities will have understandable hesitations about participating in actions that may put them or their families in jeopardy. And that’s where white allies (and other privileged people) with the protections afforded us by our whiteness, US citizenship, and socio-economic stability, must be ready to answer the call. When our brothers and sisters are recruiting people to participate in their actions, we must be ready to raise our hands. And our participation must not be an act of charity. Rather, we must stand in solidarity out of the clear conviction that, when the rights of a neighbors are in jeopardy, we are all in jeopardy; when one group in our society is being scapegoated, we are all in peril; and that only when all those around us are free can we be truly free. Social justice organizations around the country have been strategizing since Election Day about how best to respond to the specter of President-elect Trump and his Republican Congress. Those plans are not all finalized yet, and much will depend on how Trump tries to advance his platform. But one thing is for sure: large-scale protest and civil disobedience will be at the heart of our movements’ efforts to stop him in his tracks. White progressives must be ready to show up — with regularity, and with courage.